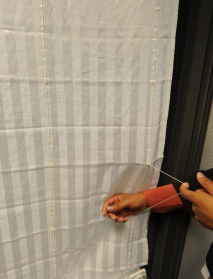 The Consumer Product Safety Commission has recalled over 50 Million window blinds due to the potential for choking small children. Parents and grandparents who have blinds in their homes, in my opinion, should immediately remove them. If you want to be certain that the brand of blind you have in your home has been recalled (and there is a good chance it has) you may check the Consumer Product Safety Commission’s website to confirm this. That window blinds pose a threat of strangulation to small children has been widely known for years. Just ask the group Parents For Window Blind Safety. There are other potential strangulation hazards in every home you must be concerned with. You may remember that the young daughter of the former professional boxer, Mike Tyson, recently was killed by strangulation by a looped cord on a treadmill, in a similar manner that these window blinds strangle children. I think the bottom line is that we cannot wait for the CPSC to act on dangers to our children. That commission simply waits too long to act. Check your home for dangerous blinds now and remove them.